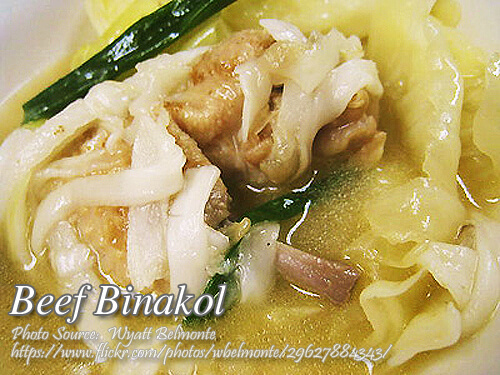 Beef binakol is a variation of chicken binakol, a popular dish in Iloilo similar to tinola but simmered in coconut water and coconut meat. Beef binakol also use the same process of cooking it with coconut water and coconut meat but since beef takes longer to cook than chicken, there is an extra step in cooking this dish. You have to tenderize the beef first by cooking it in a pressure cooker or cook it with only an ordinary cooking pot but that will take longer than the pressure cooker. To cook beef binakol; In a pressure cooker, boil beef in water for 20-25 minutes or until tender. Reserve broth. Heat oil and sauté garlic, ginger and onions. Add the beef pieces and stir fry. Add the beef stock and buko water. Let boil. Lower heat and allow to simmer for 30 minutes. Add the buko meat and carrots. Season with salt and pepper. Serve hot sprinkled with spring onions.